Home / outback steakhouse location / outback steakhouse menu / outback steakhouse review / singapore restaurants / steak review singapore / what to eat at outback steakhouse / Reduced prices at Outback Steakhouse when you order online! One of my colleagues shared with me how difficult it is on Friday evenings to find a restaurant where you can sit back and have good hearty conversations. 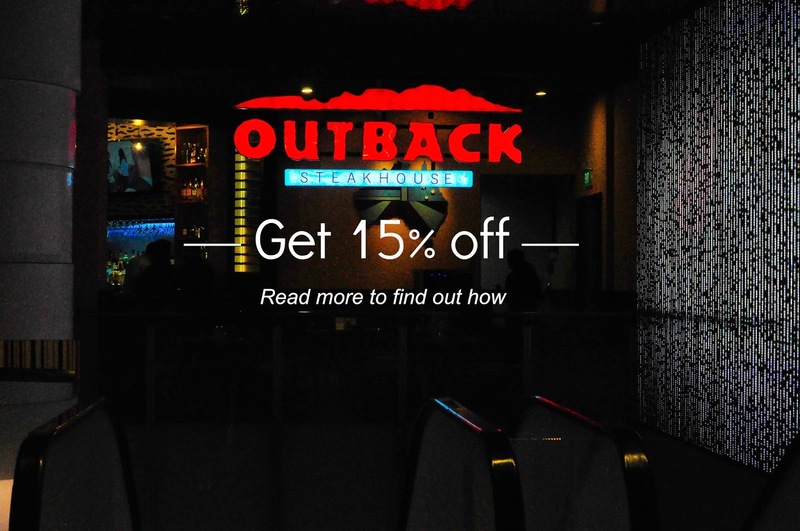 Taking it upon myself to suss out some relatively quiet dining places, I found that Outback Steakhouse at orchardgateway fit the bill pretty well. Did you know you can have their food delivered to you as well? Read on to find out more. Outback Steakhouse kicked off our meal with complimentary honey wheat bushman bread. Similar to my experience with Parisian breads, it was so difficult to saw through! However, the texture was surprisingly soft upon chewing. Crisp and golden, these tantalising triangles contain chicken breast, honey mustard, sautéed mushrooms, cheese and bacon. This is definitely one of my top picks — toasted perfectly and generously stuffed with fillings. You are advised to save your stomach for something else... unless you have a preference for soggy fries. The bacon bits were measly and the cheese did not evenly blanket most of the fries. In fact, I felt like I was eating plain fries at the bottom of the pile. The taste was really flat and we had to rely heavily on the ranch dressing to elevate the flavour profile. I don't think $9.90++ is well-spent on this. I really loved this Crab-Topped Sirloin steak, though I do wish they were more generous with the crab. I was really surprised at how well the crab meat and steak complemented each other. We ordered our steak medium-well but it turned out considerably rarer. However, the meat was very satisfying and evenly cooked. As always, Outback's baked potato did not disappoint. Ensconced within the glorious crusty skin is a buttery fragrant mound of pillowy flesh. It is soft and moist throughout. This is made with real juice, and is really refreshing. I could taste and feel the bits of berries in my mouth while gulping it down. This huge glass of icy sweet slush should be more than enough for two. 1. Enjoy 15% off food items when you order through FoodPanda! Click here to get offer. 2. The lighting within the orchardgateway branch is really bad for photos — consider enjoying the moment rather than snapping away. 3. Are you planning a huge party or gathering? Outback Steakhouse has a vast seating area. 4. If you're dining in, prices are subject to 10% service charge and prevailing GST.